It’s a beautiful sunny afternoon in North London as I sit writing this newsletter. I’ve suddenly received an afternoon back and so thought I’d put it to good use as it has been quite a while since I was in touch! I was supposed to be hitting the motorway and driving up north, but instead I’ve decided to get up extra early in the morning and take the train. It’s a bit of risk as the connections and timings are all rather tight, but I made a pact with myself at the beginning of this year that I was going to look after myself a little more. So instead of driving another 500 miles in the next 24 hours, I’ve decided to let the train take the strain. Funnily enough it was a tougher decision to make than you might have expected. You see my brother, his boys and my mum have dinner on a Wednesday night and it would have made a perfect opportunity for us all to get together. Family plays a very strong role in our lives and spending time in one another’s company is really important. However, now that we all drive, we all hold safety close to our hearts and this time it became the priority in my decision making. When you feel tired and there’s that long stretch of road ahead of you, getting behind the wheel doesn’t seem the smartest decision. Which leads me onto the topic of this newsletter. I’ve decided to focus on ‘v’ standing for values as they play such a large part in both our personal and professional life. 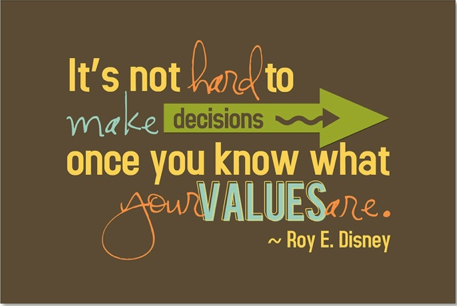 Values are the things you hold important; they’re the source of what makes you happy. They help you to prioritise and make decisions so that the choices you make in life are right for you. Taking time to understand your values is really important as it keeps you on track and helps you to live a more authentic life … one that’s for you rather than those around you. Speak to anyone and ask them what they value in life and they’ll probably be able to reel off a number of items that are important to them. And if you delve deeper, you’ll find these values make them the person they are. And this is exactly the same in business. When an organisation takes time to define its values it’s making a statement of what it holds important and how it wants to be perceived in the way it does business. When an organisation spends time thinking long and hard about what they care about, it will feel entirely right to have the values at the centre of all decisions. 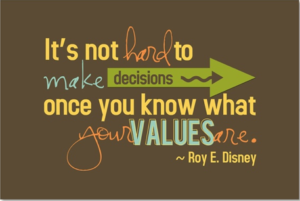 It’s only when values are created as a part of a ‘tick box’ exercise that you find yourself making exceptions from time to time, which means that you don’t actually live that value after all! I’ve experienced some organisations who have an away day, sit around the table deciding what feels right and then have a launch back into the business to introduce them. The words (values) get scattered into internal and external literature without any real process to embed them which ends up with everyone having their own interpretation of what they mean. And when individuals are challenged by a customer that they’re not living the values of the organisation, they don’t really know how to react. Map out how the values will link into business processes to ensure congruency in everything you do. Crucial in terms of customer facing processes such as complaint handling. Hold awareness sessions so that everyone is clear of how the values will drive expectations of attitudes and behaviours, outlining any consequences. Monitor and communicate quick wins – find case studies of people doing the right things as sometimes we need examples of what good looks like. Of course it’s just as important for leaders to have clarity on their values too. In my Leadership Programmes, we put emphasis on being the model of the behaviour you expect of others. And to do this effectively you must be clear about what you stand for, what you really think and believe and above all to be really aware of what you care about. If you don’t care, how can you expect others to do so? By having clarity of your values, you will have the confidence to make tough decisions and have the strength of character to act upon them. Knowing what you stand for and what is important to you will also make sure that your actions are aligned and make all your hard work worth the effort. When we do start to lose our way, our values have the ability to motivate us, refocus us on why we’re doing what we’re doing and restock our energy levels. It’s interesting to note that people who have the greatest clarity of personal and organisational values have the highest degree of commitment to an organisation. Shared values make a significant positive difference in work attitudes and performance. If you take the research carried out by Kouzes and Posner it shows that organisations with a strong corporate culture based on a foundation of shared values outperforms other firms by a huge margin. You will know what it feels like to be in a place of shared values. You feel energised as soon as you walk through the door. Whether it’s an organisation or someone’s home, you just feel as if you belong, whereas when you are not at one, you don’t have the same level of comfort. You may also be interested to note that people who are clear about their own personal values but can’t really recall the organisational ones are still more likely to stick around than those who can recite the organisational ones by heart. It’s because personal values drive commitment. Spend your time wisely – how you spend your time is the single clearest indicator, to others, about what is important to you. Watch your language – use words and phrases that best express the environment you want to create. Just a few words can make the difference in the beliefs that people articulate. Make your values active rather than passive – ask questions that make people think more purposefully about them. Gather feedback – if you don’t ask for feedback, how will you ever know the impact of your leadership? And finally, taking the word value in a slightly different sense … Don’t you feel amazing when you know that you are valued? If you’re anything like me you’ll move heaven and earth to get the right results for them. I can’t be the only one who feels that way, which leads me to think that if you really do value someone in your life, whether it’s at work or play, don’t keep it a secret. Let them know as they may not always be viewing life in the same way as you! This entry was posted in Latest News and tagged decision-making, importance, values by janehirst. Bookmark the permalink.